The next generation of Star Trek continued the original journey but was faster, more technologically enabled and more in tune with the evolving needs of the galaxy. 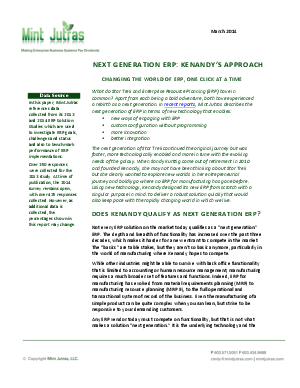 When Sandy Kurtzig came out of retirement in 2010 and founded Kenandy, she may not have been thinking about Star Trek but she clearly wanted to explore new worlds in her entrepreneurial journey and boldly go where no ERP for manufacturing has gone before. Using new technology, Kenandy designed its new ERP from scratch with a singular purpose in mind: to deliver a robust solution quickly that would also keep pace with the rapidly changing world we live in.